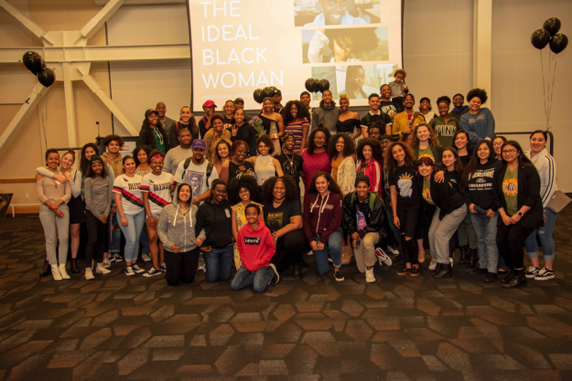 The Black Sistahood held their first annual Ideal Black Woman event on March 21. This event was a follow-up to their first annual Ideal Black Man event. The Ideal Black Woman is intended “to break negative stereotypes against black women,” according to Sunni Bates, President of the Black Sistahood and one of the organizers of the event. The event was set up in the same way as a traditional beauty pageant. There were four rounds; red-carpet attire, talent, business attire and a questionnaire. They were given a score after each round by three judges. Through the different rounds, the women showed off their multiple different personalities, interests and styles. The winner of the event was Dynnah Buckner, Kiki Kill coming in second place and Anissa Ocansey coming in third place. There were nine contestants; Afomia, Kiki, Asia, Dynnah, Kiani, Serah, Anissa, Sierra and Makayla. During each event, a PowerPoint above the girls displayed their names, graduation dates, majors and interesting facts about them. For the first round, each contestant walked across the stage wearing fancy dresses that represented their personal fashion and their idea of a red-carpet look. The second round was talent, which allowed each contestant to show off their interests and hobbies. During this round, A paper with the names of the contestants and five scoring categories was handed out to the audience to score the women along with the judges. The second contestant, Kiki, did a dance number to a song by Kendrick Lamar that earned many cheers from the audience. The third contestant, Asia, sang “Who’s Lovin’ You” by the Jackson 5. The fourth contestant, Dynnah, painted a picture using glue and had an audience member come up and throw glitter on it. The sixth contestant, Serah, performed a dance with the help of another girl. The seventh contestant, Anissa, recited an original poem. The eighth contestant, Sierra, sang a song with an accompanying performance alongside a guy and a girl. The final contestant, Makayla, performed a moving ballet dance. In the third round, each contestant walked out wearing business attire to display what they would wear to a job interview or at work. During the first three rounds, as the girls walked out and onto the stage, the audience clapped and cheered, clearly enjoying the event. The final round was the questionnaire, each contestant was asked one question and exited the stage after answering it. Before announcing the winners, the host of the event, Jake Northington, said that the intention of the event was to break down negative stereotypes that surround black women. The winner of the event was Dynnah, Kiki coming in second place and Anissa coming in third place.